It's one of the reasons I'm excited about graphene. It's about time that we started to invest in real things again. Graphene is literally the kind of game-changer that will separate the walkers from the talkers and reshape all of our industrial and commercial production possibilities. That's why this modest carbon derivative-akin to atomic scale chicken wire– has set the world's research community on fire. In fact, if you thought silicon changed the way you live, get ready for graphene. It's 200 times stronger than steel and more robust than a diamond. What's that mean in practical terms? A researcher once put it into perspective: "It would take an elephant, balanced on a pencil," he said, "to break through a sheet of graphene the thickness of Saran Wrap." 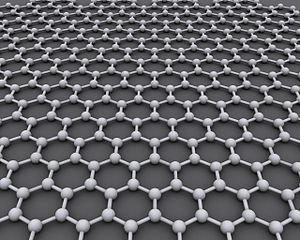 Graphene is already at the core of simple things like graphite (think pencil lead) and charcoal but it's also the building block of fullerenes (or buckyballs), carbon nanotubes, thin film supercapacitors and superconductors. It's a one-atom-thick sheet of carbon in a honeycomb crystal lattice. Researchers first started to study graphene in earnest just this past decade. Since then they have found dozens of potential applications and amazing properties that have the potential to revolutionize many industries, including sensors, batteries, computing, displays, electronics, energy generation, medicine and more. The amazing thing is, its strength isn't an impediment to its other qualities. It's also the world's thinnest material, so thin in fact that one sheet of graphene is considered a 2-dimensional object. And it is also flexible and transparent. Plus, graphene conducts electricity more efficiently than semiconductors and conducts heat exceptionally well. It is the practical equivalent of Silicon 2.0. And this doesn't even tap into its uses in the medical sector. Since it's carbon-based, as are all life forms on earth, it can enter the body without disturbing the immune system, which is a boon for drug delivery. It can also help rebuild bone and create scaffolding for creating organs and tissue. This material has so many possibilities that the European Union just granted Nokia (NYSE: NOK) a $1.35 billion grant to study the commercial applications of graphene. That's over a $1 billion from a group of nations that are struggling to get out of an economic catastrophe. If they're all collectively placing their bets on graphene, then it must be time to start looking for opportunities related to this miracle material. By now, you're probably champing at the bit for ways in which to invest in this "miracle material." So here's the deal. As far as retail investors are concerned, graphene is a very limited market – at least for now. First, there's no good way to invest in graphene – or the graphite carbon it's made from – as a commodity. That's because China controls roughly 70% of the market, much as it dominates more than 95% of the world's "rare earths" market, and Beijing is both limiting exports and charging a 20% export duty on graphene. That's one reason its price has more than tripled in the past five years. Now, there are a couple publicly traded Western graphite miners that are on track to produce graphene. But investing in any is an ultra-speculative proposition at this point. Most of them either haven't shown a profit at any time over the past five years, and trading volume on these stocks is thin, with notoriously large bid-ask spreads. Second, there are some graphene-related companies, like Michigan-based XG Sciences Inc., one of the largest U.S. graphene suppliers. It manufactures and sells "nanoplatelets" and develops specialized graphene products using them. But it's privately held and shows no sign of going public. Third, there's no real pure play in graphene research, development or manufacturing, either – but there are certainly opportunities coming down the pipeline. Around the world, governments, universities, energy companies and major corporations are pouring huge dollar amounts into graphene research and product development. Great Britain, for example, just dedicated $120 million to further graphene work at the University of Manchester; South Korea has announced $300 million in graphene projects; and the U.S. military is studying potential applications in aircraft, missiles and other high-speed, light-weight equipment. On the corporate front, several big companies are working on graphene research and applications. We're particularly interested by one large international player that's already working to bring graphene products to market in everyday products and truly commercialize this material for the first time. We're tracking that story every day. It's not quite ripe for investment, but when it is, you'll be the first to hear it. No doubt, graphene offers remarkable possibilities. It also offers substantial profits for investors, but finding the right vehicle to catch the graphene wave will be a challenge – requiring both patience and close attention. As a Money Morning subscriber, of course, you'll be the first to get all our ongoing coverage. We'll bring you the latest research and investment opportunities as they emerge. Investing in 2013: Are Chinese Solar Stocks Worth All the Recent Hype?